The story dates back to the late 1950s and revolves around an Indian Naval Officer Rustom Pavri (Akshay Kumar), who is happily married to Cynthia Pavri (Ileana D’Cruz). Their marriage hits the rocks when Rustom discovers about his wife’s affair with his friend Vikram Makhija (Arjan Bajwa). After returning early from his ship’s deployment, Rustom discovers Vikram’s love letters in Cynthia’s cupboard. While trying to find her, Rustom sees them together. He returns home and waits for Cynthia to return and then confronts her with the love letters, but walks away before Cynthia can explain. Rustom then gets himself a pistol from the Naval Ship’s Armory and makes a Trunk call to Defence HQ, New Delhi. Afterwards, he searches for Vikram, first in his office and then at his home. After Rustom enters Vikram’s bedroom, the servant hears three gun shots and rushes to the room, to discover Vikram’s body in a pool of blood and Rustom walking away with the pistol in his hand. 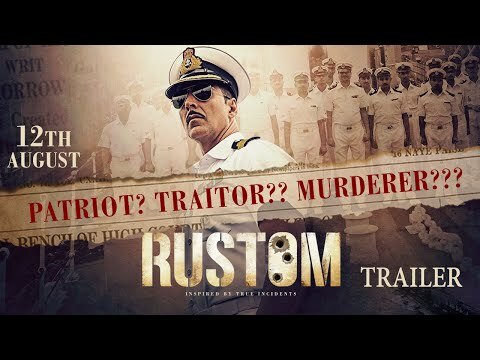 Rustom immediately surrenders to the police and Inspector Vincent Lobo (Pawan Malhotra) starts the investigation…….